Fundings: Agence Nationale pour la Recherche (ANR-15-CE03-0004). Partners: Roger S. BAGNALL (New York University, USA), Jean-Paul BRAVARD (University Lumière Lyon 2, France ; UMR 5600) ; Salima IKRAM (American University in Cairo, Egypt) et Corinna ROSSI (MUSA Centre, University Federico II, Napoli, Italy; ERC). Certain concepts evoke such powerful connotations that they obscure the complexities of the phenomena they describe. The word crisis is one such example. While the term may appear to encompass a complex series of events leading up to fundamental changes, it proves problematic in that it introduces a time-related dimension that concentrates scattered structural sequences into a limited time period. Jared Diamond, who preferred the concept of collapse (2005), has deepened our approach to thinking about the resilience of a society, be it ancient or modern, and led us to look for answers and innovations, with a special focus on the sustainability of societies. These concepts, of « crisis » or « collapse » have deeply affected historiography, in particular that of the Roman Empire, with the controversial work of Huntington for instance, who tried to think the collapse of the Roman Empire in terms of climate. Still, these concepts pose important methodological questions; namely, how should the resilience of structures be measured? What chronological scale should be privileged ? How can we assess the dynamics and inputs of crisis in a society ? In this regard, the second half of the third century AD used to be presented as a period of major political crisis within the Roman Empire. Ancient writers of both pagan and Christian faiths often associate this time with never-ending wars, barbarian invasions, famines, epidemics and earthquakes. Historians have refined this “major crisis of the third century,” in the words of Marc Bloch, over recent decades and enhanced the fact that regional situations differed strongly in the Provinces. In Egypt, signs of crisis —often hastily attributed to the third century— do not coincide chronologically in the primary source material; rather, they occur throughout a transition period from the beginning of the third century all the way to the sixth century AD. The crisis becomes challenging to grasp fully as its manifestations extend over a long period and requires a pluridisciplinary approach as it encompasses environmental, political and economical aspects. The region of the oases of the Libyan Desert, especially the Great Oasis (Dakhla and Kharga), serves as an indicator for understanding the entire period, as it is located on the edges of the Empire and felt the various problems and debates pertaining to the crisis of Late Antiquity. Against all odds, this fragile, exposed, almost insular oasis environment, whose role in the Empire’s southern defensive line has long been debated, was able to avoid collapse during a long period.? 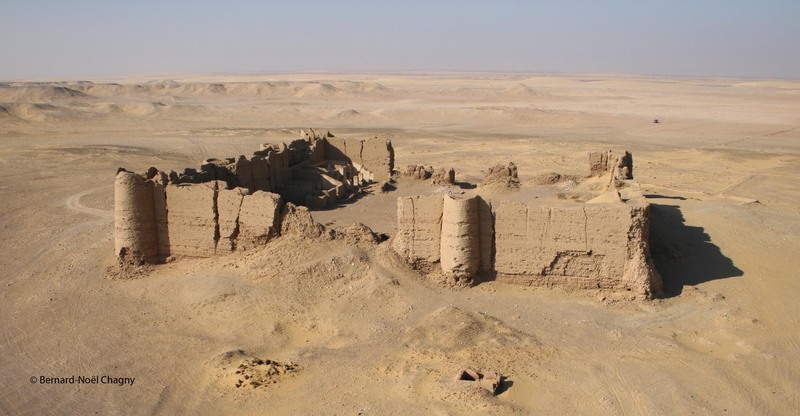 Four archaeological missions working in the Great Oasis – the Amheida team in Dakhla Oasis, directed by Roger Bagnall, the North Kharga Oasis Darb Ain Amur Survey, under Salima Ikram’s responsibility, the Umm Dabadib Mission, directed by Corinna Rossi, and the El-Deir mission in Kharga oasis, under Gaëlle Tallet’s direction- and a geoarchaeological team, led by Jean-Paul Bravard, aim at painting a more detailed picture of the situation in this major area of the Empire throughout a large transition period- first to sixth century AD- using a pluridisciplinary and collaborative methodology. The environmental, political, cultural and economical facets of the various crises faced by the Great Oasis throughout the end of Antiquity will be studied together in order to grasp the resilience and capacity of adaptation of these societies and to provide a regional frame to the understanding of the crisis of the Roman Empire.